The new Green Peak Trail Names are announced! Announcing the Green Peak Triple Chair Lift Grand Opening! Join us on Saturday, February 11th, at 10:00am for the Opening Ceremony of the Green Peak Triple Chair Lift! It is an honor for us to invite all of the Waterville Valley Resort family to join us in celebrating the most exciting event in more than 30 years! The First Green Peak Trails Are Open! We dropped the ropes today on the first two Green Peak trails, Trail 52 & Trail 53! Many guests got to be a part of Waterville history and make the first tracks on Green Peak trails! We also opened Stillness for the first time this season and more than half of our brand new chairs have been strung on the Green Peak lift line. We are making snow on Trail 51 and are groomers are going to be working on that trail and South Street today and tonight! Help Us Give These Trails New Names! Submit your suggestions and stories behind them to our Trail Naming Contest! The new Green Peak Chairs are out of the shop today and even got their first dusting of snow for the season! Some are already at their final home and being put on the line after a successful spin today on auxiliary power. Spinning the line helped to confirm that all the towers are aligned. The Lift Line is spliced and tensioned. The Comm Line is also tensioned. These are two very large steps in the Lift erection, and we can't be more excited about moving forward with that! 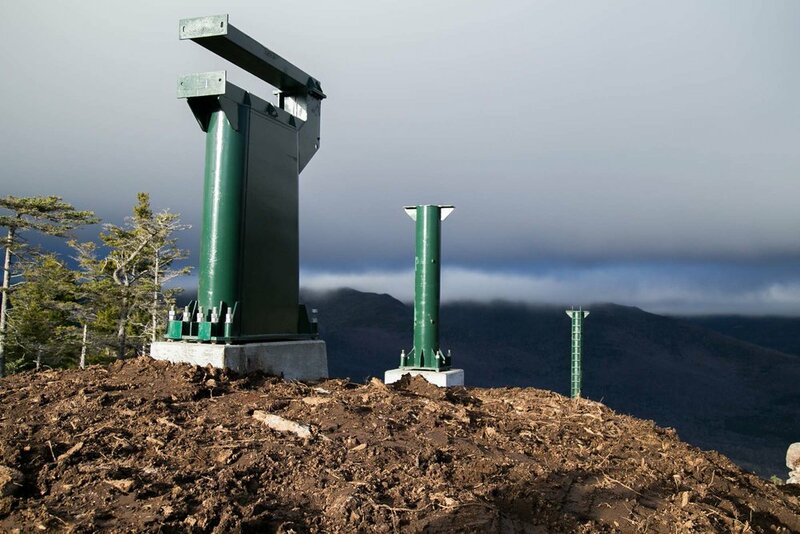 On Monday we will be placing the Top Lift Shack, and then we will proceed with the low-voltage connections. This brings us really close to the Green Peak Opening Day! The Green Peak Lift is getting a lot of work done during the Christmas week. With all the Towers up, cross arms and the communication cable ready, the haul rope will go up this week. The hardworking crew is putting together 157 chairs, which have been re-galvanized and will look and feel like new with new aluminum back slats and cushions for seats. The max speed of the Green Peak Lift will be 1800 people per hour. "Assemblies going up! Yahooooo! ", - said Wallace Weaver, our Lift Maintenance Supervisor. We are fortunate to work with such a positive and professional crew. White looks really good on Green Peak. We are beyond excited for cold temperatures and natural snow delivered by Mother Nature. A lot of work has been done before the snow covers Green Peak. Lift Towers are up and are looking monumental in the quietness of the mountains. Thanks to our great construction team, everything is getting together before we see first snowflakes. Concrete has been poured for the Green Peak lift terminal footings, as well as the top three tower footings. The remainder of the tower footing forms are in place or staged nearby. Recently galvanized Green Peak chairs arrived and are ready to be installed as soon as the lift is ready. Big moves up on the mountain today. The return bullwheel and terminal are off. Thanks Lift Maintenance team and SkyTrans. First Snow on Green Peak doesn't stop the cement truck to reach the top and complete the mission. It's happening! Bruce can't wait to be transported to the top of Green Peak for the 2016/17 Season. Thank you to everyone who joined our informational hike to Green Peak with Tim Smith. Over 100 people left their footprints on the top of the new Waterville Valley Peak! While we were on top, Sam Garber took nice pictures of Green Peak trails. Bruce the Moose is ready to help and move World Cup Triple to its new location. Green Peak base is getting ready for a new lift.